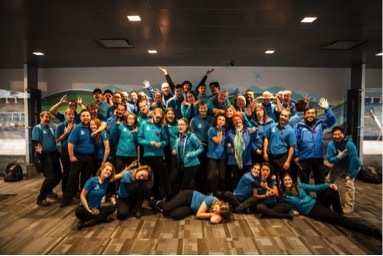 Being a tour guide in Vancouver is a little different from guiding in other Canadian cities. First, and most obvious, Vancouver doesn’t experience those famous ‘Canadian Winters’. Tours in Vancouver are conducted all year round. I suppose they can happen all year in other major Canadian cities, but you are far less likely to have to manoeuvre a bus through 10 feet of snow in Vancouver. I can’t say the same for the rest of the country during the winter. Secondly, what so many locals love about Vancouver is that within twenty minutes of driving from downtown you can be at the ocean, or even on the mountains. This means that visitors get to see way more with less travel time between stops than most other cities in the world. With all Vancouver has to offer, being a tour guide is one of the best jobs you could ever have. With that in mind, I wanted to share what a day in the life of our tour guide might look like. Every year at Landsea Tours & Adventures we continue to grow (11 new buses coming this summer, the first of which is named Chase seen below). We are currently training new tour guides and still have a few spots for anyone who might be interested in applying. Some of you may have seen our ads on social media, but to give you a real sense of what’s involved we felt that a blog post would be the best way to describe how you can have the best summer ever. Thus, here is a day in the life of a Landsea Tour Guide. Your day starts with picking up your supplies from the office. Landsea has a rotating work schedule policy, which means that everyone gets a different set of days off each week. So you can still enjoy a work/life balance even during the summer months. This also means that you get the opportunity to meet all your awesome colleagues who works at the company. When you get to the office, you grab your attraction vouchers, parking passes, hotel list, and your bus for the day. A fun fact about the company is that we name all our buses after different places in British Columbia. This helps our guests remember which bus they are on for the day. After doing a quick inspection of the bus, you are on your way to pick up your guests. Driving one of our buses downtown may seem daunting, but we have some amazing driving instructors on staff whose job it is to ensure you are up for the challenge. Through our industry recognized training program, our driving instructor team is there to help you learn and ultimately earn your Class 2 British Columbia driver’s license and have you hit the road with confidence. After greeting all your guests with the standard Landsea handshake and learning all their names, you introduce yourself to the whole group, inform them of the stopping points for the day and start the tour. Or if you’re like me, since I’m only five feet tall, I also had to assure guests that I was in fact tall enough to reach the pedals. With so much to see downtown, you can usually start the commentary wherever you are. As you head towards your first stop, you test out a few jokes (often jokes are “borrowed” from other guides), making sure that your guests are awake. While we help train our staff on commentary, we allow creative freedom; in fact, it’s encouraged! Personal stories and experiences help add a unique flare to each tour. Most importantly, stops are where you can get to know your guests. With this job, you get to meet some amazing people from so many different backgrounds. Overwhelmingly, this is what we love most about the tourism industry. You get a mix of people together who normally would never have met. We’ve had everyone take our tours: from world travellers to those just starting their adventures. For Landsea employees, there is no “correct” way to travel. In fact, I once met someone whose annual vacations included taking their child on Disney Cruises. They had been on eight cruises when I met them. 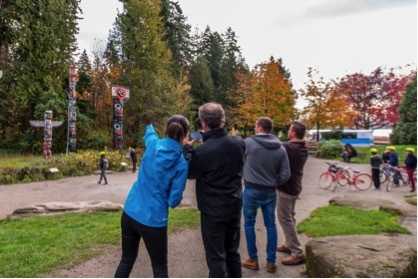 If the stop is a longer one, like at the Capilano Suspension Bridge Park, then you have the opportunity to get to know your fellow tour guides. Senior guides have a ton of experience and advice, with great stories to share. Part of the reason why we have some people who’ve been here for years is because they not only love what they do, but they love our company culture. Not to mention you get to spend the day touring around Vancouver, Victoria, Squamish, or Whistler. Few office jobs compare to getting paid to socializing on top Grouse Mountain or grabbing a bite in Granville Island. 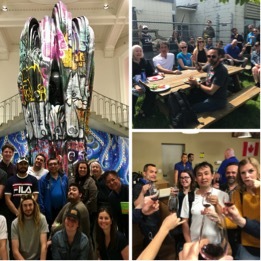 During the year, we also try to plan a bunch of different staff events from giving back to the Vancouver community to watching baseball games together. The most popular event is the annual Landsea Cup Competition, where the employees are put into teams and compete in a series of games. We even have a trophy to preserve the memory of each year’s champions, and its proudly displayed in our office. One of the best things about being a tour guide is that you never know who’ll end up on your bus, and with seven different tours, plus private charters, no day is ever the same. After your guests have seen all there is to see, you start making your way back downtown. As you start to drop people off, you say your goodbyes and thank them for joining the tour. A quick fill up on fuel and you’re headed back to the office. Ending another day as a Landsea Tour Guide. If you are interested in becoming a tour guide, Landsea Tours & Adventures want to hear from you. Spend the summer loving your job! Visit our employment page for more information. I was hired as a tour guide at Landsea in the Spring of 2014. At the time, I knew I wanted a job that would be different than past summer jobs – the prospect of waiting tables for another summer was bringing me down and tour guiding seemed like an exciting option! After having so many memorable experiences abroad during my travels, I wanted to make sure visitors to my own city would leave with the same kind of memories. After some online research I discovered Landsea Tours & Adventures and immediately applied. For many newly hired guides, the most daunting part of the job is learning to drive a 24-passenger bus. What amazed me most about the hiring process is the confidence management has in you. The driving part of the job almost seemed secondary to your passion for the city and it’s surrounding geography. Essentially, they were looking for passionate guides, not just bus drivers. Once hired, driver training took up the majority of the month-long training process. I remember getting behind the wheel for the first time in Stanley Park. White knuckled, I made loops around the perimeter of the park and by the third time I was feeling pretty comfortable! Especially with the other guides-in-training cheering me on the whole way. For me, the best part of the training process was how close I became with the other new guides in my training group. We were quite the mix of people: a former radio host, a recent grad, an ex-cruise ship employee, and myself – a current student. We each had our own unique experiences to bring to our tours and different stories to share. This is one of the things that makes Landsea such a great company to work for. Everyone is encouraged to put their own spin on their tours and to really make it your own. For this reason, no one’s tour will ever be the same. For example, I grew up in Victoria and went to the University of Victoria so I have plenty of stories I like to share with my guests on my Victoria tour. People seem to really enjoy the personal touch. I find it is important to have something that motivates you on every tour. For me, it is the fact that a lot of the guests we take on tours have worked hard to save enough money to bring their family here on vacation for their once-in-a-lifetime experience. Although for us it is just another day at the office, it isn’t difficult to give guests a memorable experience here in Vancouver. The beauty of the landscape is enough to amaze first-timers. What takes their experience to the next level is something that can’t be captured in a photograph. It is the personal connections they make during their trip. What seems like a small gesture on my end can have a huge impact on a traveller’s overall experience and their perception of Vancouverites. One of my most memorable guests was a woman travelling by herself from Lithuania who desperately wanted to see the Ogopogo and asked me where to find it. She didn’t seem phased by my insistence that this mythical creature probably doesn’t exist, so I told her about Lake Okanagan and the many ways to get there. After a busy day in Victoria, I dropped her off at her hotel and as she stepped out of the bus she gave me a hug and told me that I was perfect and to never change. I will never know that if she ever found the Ogopogo but she definitely made my day and I still smile when I think of her. Guests sometimes ask, “Do you ever get sick of doing these same tours?” My answer is always, “No” because not one of my tours has ever been the same. Just like the city never looks exactly as it did the day before and just like the nationalities, demographics, and languages of my guests are always changing from one tour to the next. That is why I love this job! 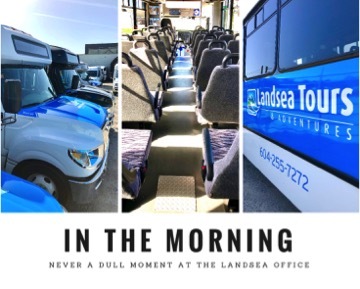 We are releasing our second post in our series written from a member in the Guest Services department who’s been with Landsea Tours & Adventures for close to five years now. My journey with Landsea Tours & Adventures started back in March of 2011. 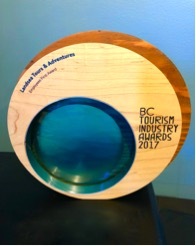 I was a student in the Bachelor of Tourism Management program at Capilano University when I first started hearing about Landsea. Kevin Pearce, the President of the company, is a graduate of the program as well and is still involved in various aspects with the university. The day I decided I wanted to work for the company was in 2009 when they were running the “Stuff the Bus” (charity) campaign and had a collection day at the school for second-hand clothing and blankets. I spent some time talking to and hanging out with Kevin, Travis (our Operations Manager), and, funny enough, two other girls that also worked and currently work for the company. 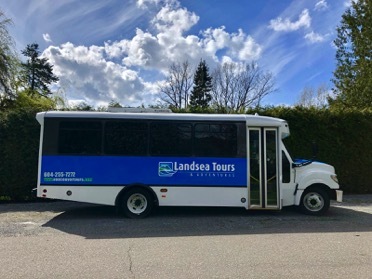 My next interaction with the company was when our class went on a trip to Tofino and Landsea provided our transportation. Our drivers included Kevin and three other tour guides who, throughout the whole trip, just fit in perfectly with the group. They interacted and hung out with us through all the various activities we had planned. They even came with us to watch the activities they weren’t able to participate in. Needless to say, both interactions were fun and positive, so Landsea was on my mind for a potential place to work. Between semesters, I moved up to Whistler with some friends for about six months. When I came down to the city, I had odd jobs here and there while going to school. I was working at a small coffee shop in North Vancouver when a lady came up to order a coffee and we started talking about what she did for work and, as it turned out, she worked for Landsea at the time! I decided this was finally the time to apply for a job with the company. I sent Kevin a message saying I was looking for a job and would love to work for his company, filled out an application and had my interview shortly thereafter. My first year definitely had its ups and downs. I faced many struggles that year, both professional and personal, but I was able to use all the experience I gained as a learning tool and came back my second year much stronger on both fronts. I was given a second chance and I wanted to use it to show that I was better. That I was capable of so much more than what I had given up to that point. Over the next handful of months, I started becoming more involved in various aspects of the company. I started taking on small tasks that turned into bigger projects. I was challenged in new ways by being able to help out our management team with different tasks they needed to get done and was involved in a few decision-making processes. I was given more responsibilities each year ranging from helping our accounting department to training our Guest Services team. The list of opportunities goes on and on all because of our management team who believes that I can do more and pushes me out of my comfort zone. I have been given the opportunity to use what I’ve learned in school but I’ve also learned so much more. Lessons that school can never teach you. There is always room to grow. I have many favourite moments as cliché as that may sound, such as pop-up BBQ’s to decorating the office for a holiday. Plus every little moment that can happen for whatever reason during the day. They all create memories that I will look back on and smile because I just can’t help it. Then there is Landsea Cup Day that’s held every year. The day starts with majority of all staff going to the Tourism Awards breakfast, an event recognizing tourism workers who provided outstanding customer service throughout the year. This is followed by the main event such as a scavenger hunt with Sewell’s Marina or, like this past year, going curling at the Vancouver Curling Club followed by a round of competitive trivia! There are many random events that can occur at our office that provide endless amounts of entertainment. You’d be hard pressed to experience a boring day. Our neighbours have a pet pig that is an escape artist and often comes down our way to feed on the grass and say hi! His name is Wilbur and we’ve unofficially adopted him as our office pet. We found out not too long ago that he has a new brother named Olaf! Everyday life in the office can include being stressed one moment, excited another and relaxed the next. In the morning, while most tours are departing, can be sometimes quite stressful and this is where teamwork comes into play. Everyone plays his or her own role, but we all work towards the same goal. Whether it’s short-term such as getting a tour to depart on time or a long-term goal such as offering the best level of customer service we can. When thinking of life in the office, words such as teamwork and initiative are the first to come to mind. Daily operations depend heavily on both being able to work efficiently as a team and effectively as an individual.